Every Thursday night from 9p-12a, there is live jazz! Real jazz. Pearlz Upstairz lounge has a great ambience overlooking Columbia’s famous Vista district and there is never a cover charge. Pearlz Upstairz is one of the few REAL jazz lounges in and around Columbia, SC. Come enjoy the adventures in jazz with friends or a date, enjoy great drinks and a wonderful atmosphere. Mark Rapp is the bandleader and always has a phenomenal band with him. His regular band consists of Internationally known and award winning guitarist Amos Hoffman, Dustin Retzlaff on bass and Brendan Bull on drums. 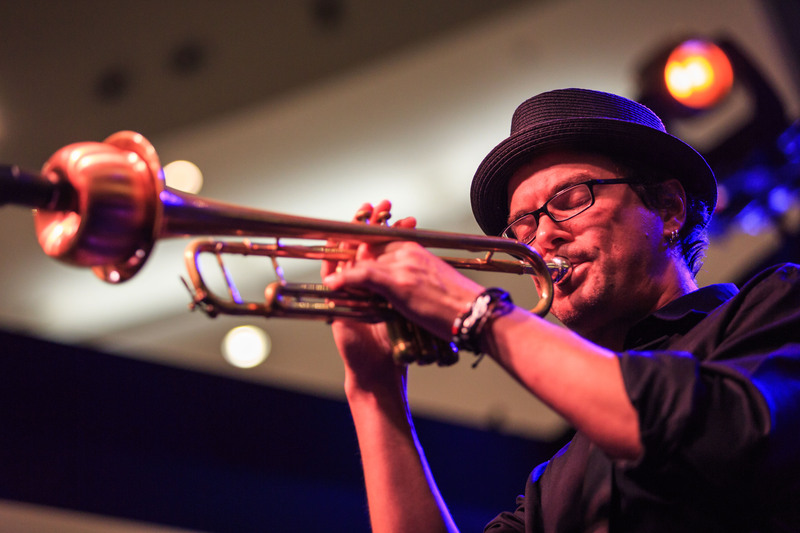 Trumpeter, composer, arranger, didgeridoo player, recording and touring artist Mark Rapp has performed with such distinct artists from Delfeayo & Branford Marsalis to country star Darius Rucker. Rapp has released 8 diverse recordings and appears as a sideman on a myriad of projects including Disney’s “Everybody Wants to be a Cat” alongside Roy Hargrove, Dave Brubeck, Esperanza Spalding, The Bad Plus, Joshua Redman and more. Rapp’s celebrated 2009 debut release “Token Tales” earned him a spot as a “Top Emerging Trumpeter” in Downbeat Magazine. His release “Good Eats” had critics saying, “Rapp is quickly developing a reputation as a superb interpreter and great stylist.” – AllAboutJazz.com. Rapp is a featured artist in Mellen Press’ “How Jazz Trumpeters Understand Their Music” among a prestigious list including Terence Blanchard, Lew Soloff, Freddie Hubbard, Tim Hagans, Dave Douglas and more. Rapp also composed and produced a jazz ballet “Woven: Life in Notes and Steps” (wovenballet.com). He has performed in jazz clubs and festivals around the world from Croatia, Brasil, Austria, Switzerland, USA and more including back-to-back appearances at the 2017 & 2018 New Orleans Jazz and Heritage Festival. As the founder of ColaJazz.com, a jazz initiative to grow, elevate and support the jazz community in and around Columbia, SC through events, education, recordings, and advocacy, Rapp has produced and released 2 compilation CDs featuring over 20 local bandleaders involving 30+ musicians. Rapp created and launched the USC ColaJazz Camp in 2017 featuring Delfeayo Marsalis; the 2018 camp clinician was NEA Jazz Master Dave Liebman. He also produced the 2018 ColaJazz Festival featuring Chris Potter. Rapp is a prominent figurehead, performer, and activist of jazz in SC and in February 2018 was named an Ambassador of Jazz for the State of South Carolina by the SC House of Representatives. Jazz clubs around the world from Snug Harbor (New Orleans), Blue Note (NYC), The Jazz Standard (NYC), Yoshi’s (San Francisco), Blues Alley (Washington, D.C.), Jazzland (Vienna, Austria), AMR (Geneva, Switzerland), Clube do Choro (Natal, Brasil) to Jazz Tunnel (Zagreb, Croatia). Jazz festivals around the world from the JVC Newport Jazz Festival, Fillmore Jazz Festival, New Orleans Jazz & Heritage Festival, WC Handy Festival, Festival AMR des Cropettes (Switzerland), JazzTimes Festival in Croatia to the Jazz&Blues Festival in Garanhuns, Brazil. Mark has been guest soloist with Big Bands, recorded as a special guest artist on CDs, played in the United Nations Symphony Orchestra, and has had many jazz greats perform in his bands including bassist James Genus (Herbie Hancock, Brecker Brothers, Saturday Night Live, Aretha Franklin), Walter Blanding, Jr, Don Braden, Wycliffe Gordon, Nate Smith, Clerence Penn, Wess ‘Warmdaddy’ Anderson and many others.